Purist alert! This pair of Danish modern stacking dining chairs is made of teak and beech. The seat is teak and the frame is beech. Freshly waxed, just for you. The "Heart Chair" was designed by Hans Wegner. Made in Denmark by Fritz Hansen, 1950s. Incredible delights! Beautiful condition. Fresh wax. One Hans Wegner chair model # JH 501 in oak. Vintage circa 1949. Newly re-caned by premiere Chicagoland restorer. An absolute iconic design. 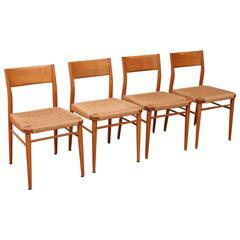 Early Georg Leowald Birch dining chairs for Wilkhahn (German) furniture company. Seats are woven with an intricate pattern and boast a handsome patina. Hans Wegner set of six wishbone chairs in a coral paint. Chairs show patina, and caning has some wear. Couple chairs retain their original decal labels. Beautiful pair of round chairs by Hans Wegner. Cane seats. One seat was replaced so a slight variation in color that will disappear over time. Both show very well.